NORTH BAY, Ont. — The North Bay Battalion plays host to the Windsor Spitfires at 7 p.m. Thursday to open a three-game weekend schedule as the calendar moves from January to February. 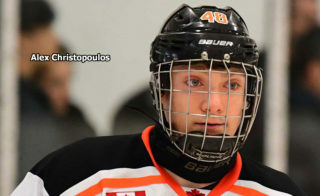 North Bay has a won-lost-extended record of 23-22-3 for 49 points, fourth in the Ontario Hockey League’s Central Division, one point behind the Mississauga Steelheads, whom the Battalion visits Friday night before entertaining the Sarnia Sting on Sunday. Windsor, 20-26-3 for 43 points, fourth in the West Division, is 0-5-0 since a 5-0 home-ice verdict Jan. 17 over the visiting Erie Otters, who are at Mississauga on Thursday night. The Windsor game completes a run of five home games in which the Battalion, beset by occasional slow starts, so far has posted a record of 2-2-0, defeating the London Knights in overtime and the Kingston Frontenacs, while losing to the Sault Ste. Marie Greyhounds and Sudbury Wolves. “We’ve had some games that we haven’t been ready to go right from the drop of the puck, so it’s about going through and addressing some of those things, getting to the bottom of why it’s happening and really just putting it on your leadership group and forcing them to make sure that it gets fixed and that we come out ready to play next game,” assistant coach Adam Dennis said Wednesday. Dennis acknowledged that the coaching staff shares in any fault related to bad starts. “It reflects on all of us. It’s something that, when it happens, we go to the well and we try to figure out ways that we can fix it, anything that we can try and change. With 20 games left on the schedule, Dennis said there’s an increased urgency in preparation. The passing of the trade deadline Jan. 10 and the arrival of the pre-playoffs stage of the season mean that teams focus their efforts with somewhat more certainty and effectiveness, Dennis noted. 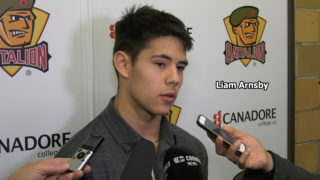 Justin Brazeau may be feeling the effects of such a change as he continues on his path to overtaking Mike Amadio as the leading scorer in the Battalion’s North Bay era, which began with the 2013-14 season. 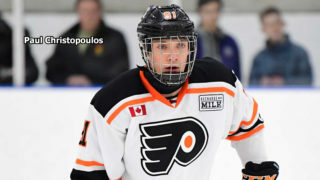 Right winger Brazeau, a 13th-round pick in the 2014 OHL Priority Selection, is seventh on the franchise scoring list with 205 points, from 110 goals and 95 assists, in 248 games. 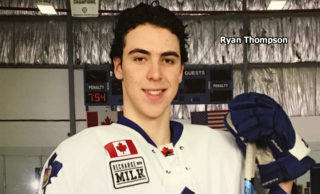 He needs two points to tie Amadio, who, after 19 points in 63 games as a rookie in Brampton, played 200 games for North Bay, scoring 86 goals and earning 121 assists for 207 points. 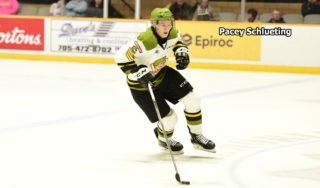 In 48 games this season, captain Brazeau has team-leading totals of 43 goals and 37 assists for 80 points, including one goal and one assist in the Troops’ most recent outing, a 4-0 decision Sunday against Kingston. Brazeau has been held without a point in 13 games, with five of them coming in the last 13 games after he was off the scoresheet eight times in the first 28. Amadio holds the franchise record of 50 goals in a season, set in 2015-16, which is another Brazeau target. Centre Matthew Struthers, who assisted on all four goals against Kingston, is second among Battalion points producers with 56, from 21 goals and 35 assists in 41 games. 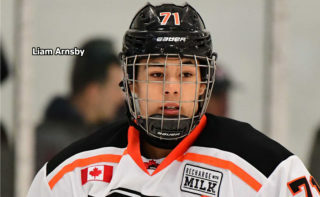 Left winger Brad Chenier, who has 23 goals and 26 assists for 49 points in 47 games, sat out Sunday with a knee injury suffered last Thursday night in a 7-0 loss to Sudbury and is sidelined for several weeks. The Windsor game marks Bruce Power Night in partnership with the Brain Tumour Foundation of Canada.